For the politician, see Margaret O'Brien (politician). 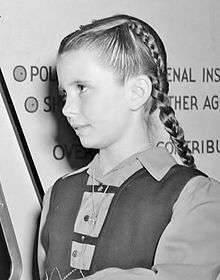 Margaret O'Brien (born Angela Maxine O'Brien, January 15, 1937) is an American film, radio, television, and stage actress. Beginning a prolific career as a child actress in feature films for Metro-Goldwyn-Mayer at the age of four, O'Brien became one of the most popular child stars in cinema history and was honored with a Juvenile Academy Award as the outstanding child actress of 1944. In her later career, she appeared on television, on stage, and in supporting film roles. 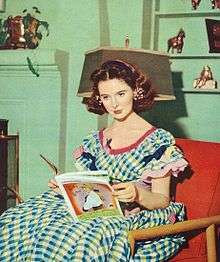 Margaret O'Brien was born Angela Maxine O'Brien; her name was later changed following the success of the film Journey for Margaret (1942), in which she played the title role. Her father, Lawrence O'Brien, a circus performer, died before she was born. O'Brien's mother, Gladys Flores, was a well-known flamenco dancer who often performed with her sister Marissa, also a dancer. O'Brien is of half-Irish and half-Spanish ancestry. O'Brien made her first film appearance in Babes on Broadway (1941) at the age of four, but it was the following year that her first major role brought her widespread attention. 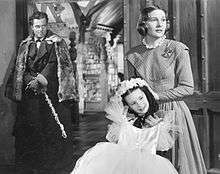 As a five-year-old in Journey for Margaret (1942), O'Brien won wide praise for her convincing acting style. By 1943, she was considered a big enough star to have a cameo appearance in the all-star military show finale of Thousands Cheer. 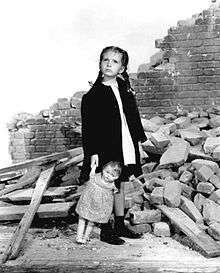 Also In 1943, at the age of seven, Margaret co-starred in, "You, John Jones," a "War Bond/Effort," short film, with James Cagney and Ann Sothern, (playing their daughter), in which she dramatically recited President Lincoln's "Gettysburg Address." She played Adèle, a young French girl, and spoke and sang all her dialogue with a French accent in Jane Eyre (1943). 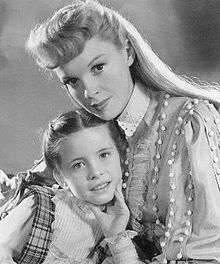 Arguably her most memorable role was as "Tootie" in Meet Me in St. Louis (1944), opposite Judy Garland. As she told the true story on a Turner Classic Movie special, Margaret was known as one of "the Best Cryers" on the MGM lot, but she was having a tough time crying, so to get Margaret to cry during a crucial emotional scene in the movie, her mother told her that "June Allyson, (another one of MGM's Best Cryers), is a better cryer than you!!" No surprise, she cried, and was wonderful in the role of "Tootie." O'Brien had by this time added singing and dancing to her achievements and was rewarded with an Academy Juvenile Award the following year as the "outstanding child actress of 1944." Her other successes included The Canterville Ghost (1944), Our Vines Have Tender Grapes (1945), Bad Bascomb (1946) with Wallace Beery, and the first sound version of The Secret Garden (1949). She played Beth in the 1949 release of the MGM movie, Little Women, but she was unable to make the transition to adult roles. O'Brien later shed her child star image in 1958 by appearing on the cover of Life magazine with the caption "The Girl's Grown", and was a mystery guest on the TV panel show What's My Line?. O'Brien's acting roles as an adult have been few and far between, mostly in small independent films. However, she does do occasional interviews, mostly for the Turner Classic Movies cable network. O'Brien gave television credit for helping her to change her public image. In an interview in 1957, when she was 19, she said: "The wonderful thing about TV is that it has given me a chance to get out of the awkward age -- something the movies couldn't do for me. No movie producer could really afford to take a chance at handing me an adult role." On December 22, 1957, O'Brien starred in "The Young Years" on General Electric Theater. She played the role of Betsy Stauffer, a small town nurse, in "The Incident of the Town in Terror" on television's Rawhide. She made a guest appearance on a 1963 episode of Perry Mason as Virginia Trent in "The Case of the Shoplifter's Shoe." In 1967, she made a guest appearance on the World War II TV drama Combat!. Also, in a 1968 two-part episode of Ironside, ("Split Second to an Epitaph," O'Brien played a pharmacist who (quite the opposite of her usual screen persona) was involved in drug theft and was accessory to attempted murder of star Raymond Burr's "Ironside." Another rare television outing was as a guest star on the popular Marcus Welby, M.D. in the early 1970s, reuniting O'Brien with her Journey For Margaret and The Canterville Ghost co-star Robert Young. In 1991, O'Brien appeared in Murder She Wrote, season 7, episode "Who Killed J.B. Fletcher?". While O'Brien was growing up, her awards were always kept in a special room. One day in 1954, the family's maid asked to take O'Brien's Juvenile Oscar and two other awards home with her to polish, as she had done in the past. After three days, the maid failed to return to work, prompting O'Brien's mother to discharge her, requesting that the awards be returned. Not long after, O'Brien's mother, who had been sick with a heart condition, suffered a relapse and died. In mourning, 17-year-old O'Brien forgot about the maid and the Oscar until several months later when she tried to contact her, only to find that the maid had moved and had left no forwarding address. In February 1960, O'Brien was honored with two stars on the Hollywood Walk of Fame, one for motion pictures at 6606 Hollywood Boulevard, and one for television at 1634 Vine St. In 1990, O'Brien was honored by the Young Artist Foundation with its Former Child Star "Lifetime Achievement" Award recognizing her outstanding achievements within the film industry as a child actress. In 2006, she was presented with a Lifetime Achievement Award by the SunDeis Film Festival at Brandeis University. 1948 Suspense "The Screaming Woman" 25 November 1948 Ray Bradbury Margaret Leary (girl) Thanksgiving themed radio drama. Agnes Moorehead as the screaming woman. ↑ TCM.com - "Biography for Margaret O'Brien", March 3, 2011. 1 2 "17th Academy Awards". Oscars.org. Retrieved March 31, 2011. ↑ Ewald, William (December 5, 1957). "TV Gives Margaret O'Brien Chance To Get Out Of The Awkward Age". The Bristol Daily Courier. p. 38. Retrieved April 14, 2015 – via Newspapers.com. ↑ "Margaret O'Brien In GE Drama". The Sandusky Register. December 12, 1957. p. 46. Retrieved April 14, 2015 – via Newspapers.com. 1 2 3 4 5 6 7 8 9 Zamichow, Nora (March 7, 1995). "Fairy Tale End for Stolen Oscar". LATimes.com. Retrieved July 12, 2011. 1 2 3 4 "An Interview with Margaret O'Brien". Hollywoodland. Retrieved July 12, 2011. 1 2 "Actress Gets Stolen Oscar Back". SFGate.com. June 23, 2011. Retrieved July 12, 2011. ↑ "Margaret O'Brien's Stolen Oscar". Hollywoodland. Retrieved July 12, 2011. 1 2 "Margaret O'Brien – Hollywood Walk of Fame". WalkofFame.com. Retrieved March 31, 2011. 1 2 "11th Youth in Film Awards". YoungArtistAwards.org. Retrieved March 31, 2011. 1 2 "Those Were the Days". Nostalgia Digest. 39 (1): 32–41. Winter 2013. 1 2 3 4 5 6 7 Old Time Radio Review: Suspense - episode review of "The Screaming Woman"
1 2 3 4 OTR Plot Spot: Suspense - plot summaries and reviews. ↑ CROSBY AGAIN LEADS IN FILM BOX OFFICES New York Times (1923-Current file) [New York, N.Y] 27 Dec 1946: 13. ↑ Bing's Lucky Number: Pa Crosby Dons 4th B.O. Crown By Richard L. Coe. The Washington Post (1923-1954) [Washington, D.C] 03 Jan 1948: 12. 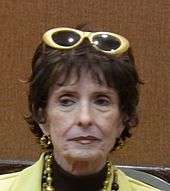 Wikimedia Commons has media related to Margaret O'Brien. Interview with Margaret O’Brien – Ottawa Times, December 3, 2014.